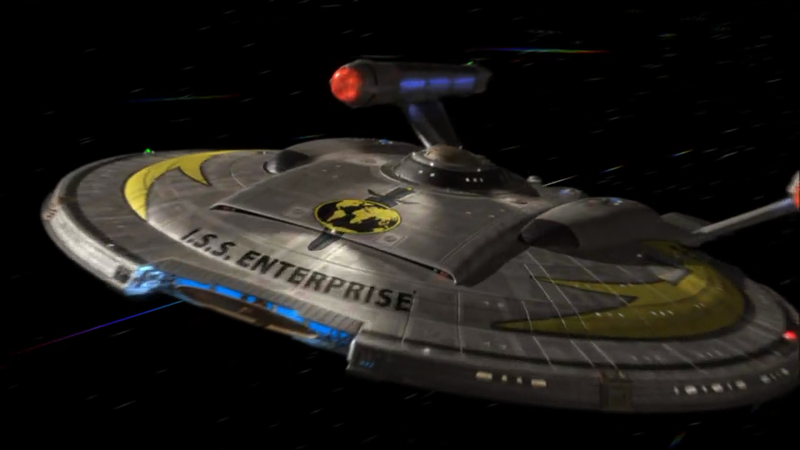 Could the NX-02, Columbia, have appeared again in Enterprise season 5? With all this talk of cancellation, I thought it might be interesting to go back to some of those shows that were struck down in their prime, to see just what we all missed out on. One of the most well-documented cases is that of Star Trek: Enterprise season 5, which the former producers have been quite open about discussing. While some people hold out hope that Enterprise might be revived on Netflix, the reality is that as long as the movies are going, there’s no chance, and even if it was to somehow return, they’d likely have to come up with some new ideas (preferably ones that avoid the problems with prequels). Given this, let’s take a look at the fifth season we might have seen, in some alternate universe where networks in 2005 understood the concept of DVRs. 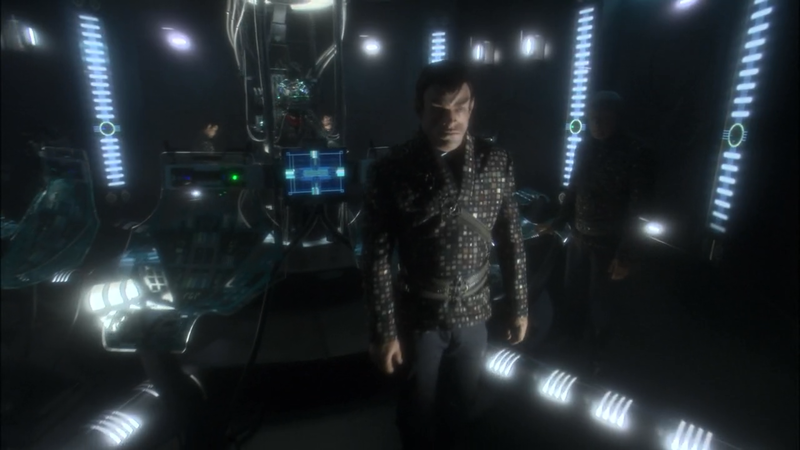 The Romulan plot revealed in “Babel One” was only the beginning. 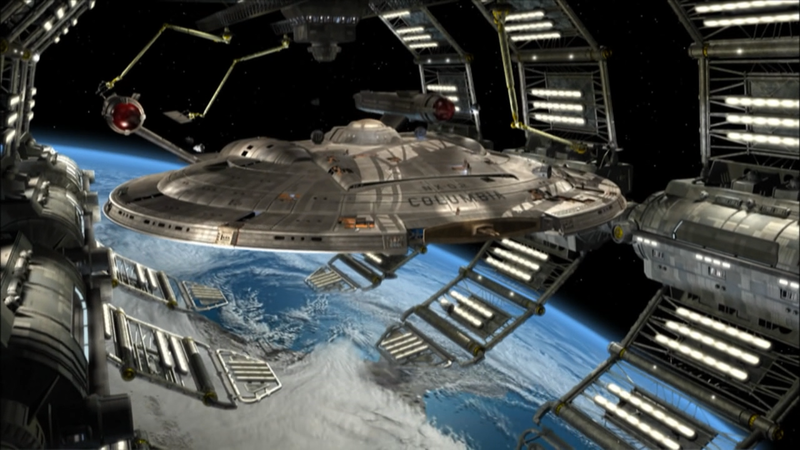 According to Manny Coto, who was the showrunner for season 4 and the source of most of this, there were two obvious themes that Enterprise Season 5 would have focused on: the Earth-Romulan War, and the foundation of the Federation in response to that, which were both hinted at in the drone story arc running through “Babel One,” “United,” and “The Aenar.” The war is something that fans had been clamoring for all along, as it’s one of the biggest unexplored points in roughly the same timeframe as Enterprise, so naturally hearing that we just missed out was quite the disappointment. It’s generally agreed that season 4 was the best, finally doing the kind of thing that a prequel should be doing: exploring and expanding on bits of backstory that the other shows had laid out, rather than introducing new things like the Xindi attack which leave fans wondering why they’d never heard about these guys before. “These Are The Voyages…” seems to have been a way for them to jump ahead to the founding of the Federation once the news of cancellation was upon them. Founding of the Federation, and the growing trust between the various species leading up to that, would have had some other interesting consequences, such as potentially bringing Jeffrey Combs’ Shran aboard in some kind of advisory capacity. Destroying Shran’s ship in the aforementioned three-parter was likely part of the lead up to his joining the crew by freeing the character of his own responsibilities. Combs was a long time Trek actor and Shran was a popular and fascinating character, so this would have been welcome news all around. I think Shran’s addition could have been for Enterprise what Seven of Nine was for Voyager: a new, interesting element overflowing with possibilities, as well as a window into one of the Federation’s founding species that we otherwise knew little about. Combs recently did an AMA on reddit where he discussed his take on the possibility. There was also talk of creating a refitted Enterprise, one with the secondary hull that we see on the ships from TOS, TNG, and Voyager. The proposed refit has since been rendered and sketched a number of times, including in the “Ships of the Line” calendars. This is something that’d probably have been more dependent on the budget for Enterprise season 5, given that it would mean older CGI shots could no longer be reused. The Remastered version of Stratos. Did this really need to be revisited? 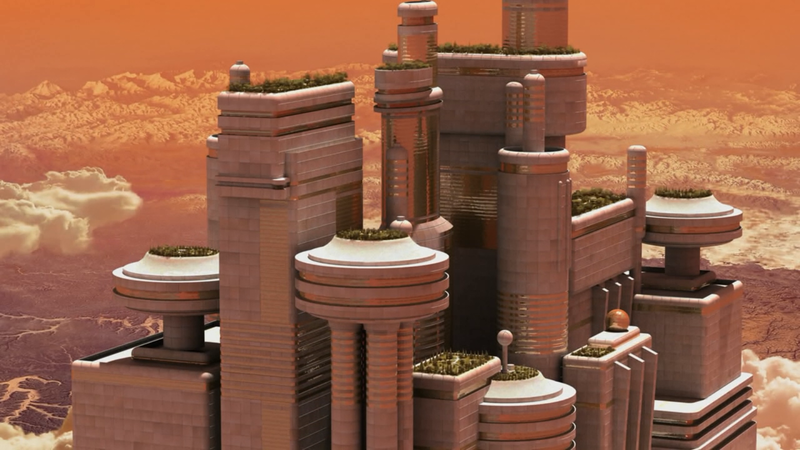 Manny Coto wanted to set a two-part episode in the floating city of Stratos, which was a location seen in one of the last episodes of the Original Series, which featured a highly segregated, classist society. Stratos was the home of the wealthy, while the exploited miners on the surface were transformed by the deadly chemicals they were exposed to. Presumably such an episode would explore the growing divide between the two cultures, and how they came to be so detached from one another. While the floating city does provide a visually interesting setting, I really don’t know if there’s enough to explore in the background of such a place to make it worthy of being the focus of an entire episode, much less two. It’s the kind of place that doesn’t really need much explanation, unless they wanted to somehow restore the message of the TOS episode, which was muddled in the transition to television. Judith and Garfield Reeves-Stevens, long-time expanded universe authors who are probably best known for ghostwriting the so-called “Shatnerverse” novels, joined the writing team in season 4, and had pitched a number of ideas for potential future episodes. Among these was an origin story for the Borg Queen, where a scientist played by Alice Krige (who portrayed the Borg Queen in First Contact as well as Voyager‘s finale) is assimilated while studying the wreckage left behind during that movie, which itself was recovered in “Regeneration”. It’s probably for the best that this didn’t happen, as it would’ve been a continuity nightmare; the Borg queen has specifically identified herself as being not human in the past (referring to her species as simply species 125), and any further dealings with the Borg in the Enterprise era would have only made the problems resulting from that episode more difficult to resolve. It would, however, explain the Borg’s apparent fascination with Earth and why the queen was so eager to get a human like Picard to become her companion. Another episode idea pitched by the pair included a possible appearance by Shatner himself, playing an older Mirror!Kirk who had been trapped in the past and was trying to return home. This would have ultimately led to the accidental creation of the Mirror Universe, which leaves us with all kinds of headache-inducing problems that manage to outclass even the traditional predestination paradox. As far as this goes, I think we should all be satisfied with the Mirror Universe episodes we got, eh? Further adventures in the Mirror Universe awaited. Manny Coto also said he wasn’t done with the Mirror Universe, hoping to revisit it and show the aftermath of Empress Hoshi’s takeover. He hoped to have several such episodes, scattered throughout the season such that it would effectively be its own mini-series within the larger season. It’s a fascinating idea, one that demonstrates the kind of unique ideas Coto had brought to the show with him. Envisioning it, it seems like it’d be almost a “Game of Thrones in space,” which would have undoubtedly been extremely popular in hindsight. With the Mirror Universe being one of the most iconic things to come out of TOS, it makes sense to give it some attention in a prequel. Brannon Braga once said that they’d considered setting the entirety of Enterprise season 5 in the Mirror Universe, but I think we can all agree that would be a terrible idea, and I can’t imagine it was actually seriously considered for long, if at all. One of the more intriguing episode plots, discussed by show writer Mike Sussman, is the potential reveal of T’Pol’s father as a Romulan spy. The idea itself is absolutely brilliant. It would have explained so many inconsistencies in her character–her fascination with emotions and lack of control over them, her general inability to get along well with other Vulcan characters on the show, her inclinations towards violence when working at the Ministry of Security… Still, it would’ve had problems of its own, such as the fact that it’s specifically stated in “Balance of Terror”, the TOS episode which featured the debut of the Romulans, that no human had ever laid eyes on a Romulan. It’s not an insurmountable obstacle, and with what this revelation would have added to the character, I think it would have been worth it. An episode designed to be a prequel to the Animated Series episode “The Slaver Weapon.” That episode was written by Larry Niven and adapted from his Known Space story “The Soft Weapon.” It would have been the first live action episode to feature the Kzinti and one of the first explicit acknowledgments of the Animated Series as canon. An episode focused on the construction of the first Starbase. Sounds like it would have needed another element to it to be compelling, possibly some relationship to the Romulans given the focus on them in Enterprise season 5. An episode dealing with Flint, the immortal man seen in “Requiem for Methuselah” of TOS. I don’t think anyone was holding their breath for this one. A different Shatner appearance, where he’d have been the cook instead of Riker. He’d then be picked up by Crewman Daniels to impersonate Kirk at some point in the future. It’s a little reminiscent of the Deep Space 9 episode “Past Tense,” which also involved historical impersonation. Since this episode focuses almost exclusively on Shatner, it seems like maybe this was pitched as an alternative to assuage his infamous ego. Visiting Doctor Phlox’s homeworld, Denobula. It seems more or less inevitable that they’d have gotten around to it eventually. Potentially seeing the Columbia a few more times, and expanding on its crew. An episode with Guinan making an appearance, of which apparently several different versions were bounced around. One of these versions reportedly also involved Spock’s grandfather, Skon. The veracity of this one is especially shaky. And so that, friends, is an idea of what Enterprise season 5 might have looked like. In a different reality, we might have found Enterprise amazing. A show that, like TNG and DS9 and so many others, struggled until it found its footing a few seasons in and ascended into greatness. But for now, in our world, we’ll have to settle for four, and be left wondering what could’ve been. There’ll be more of these in the future, so if you’d like, you can subscribe to the “What Could Have Been” RSS Feed here. If you’re in the mood to relive Enterprise, you can watch it on Amazon Instant or Netflix.